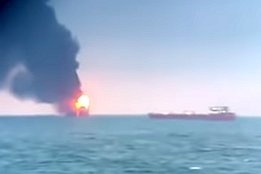 As many as fourteen people are reported to have died and a further eight are missing following an explosion as fires engulfed two ships today during a ship-to-ship fuel transfer in the Black Sea. Alexei Kravchenko, spokesman for Russia's federal agency for maritime and river transport (Rosmorrechflot), is widely reported as saying one of the vessels involved is the LPG carrier Maestro. The other vessel, said to be either a gas carrier or other general tanker, is being reported as named either Kandy, Candy, or Venice. Both vessels are said to be flying the flag of Tanzania. Sources told Reuters there were stormy sea conditions when the fires broke out, while Russian media outlets including RT say the ships caught fire after an explosion on one of the vessels. Video footage of the incident has been widely shared on social media, which has also drawn attention as is occurred in the politically sensitive Kerch Strait. "Our vessel Spasatel Demidov is extinguishing the fire," Sputnik quoted a Rosmorrechflot spokesperson as saying. "Eight people remain missing. The search and rescue operation continues." Reports indicate the two vessels have a combined 31 crew. ABS, GNV claim success with energy-saving technology.